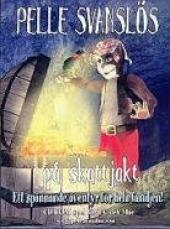 This is an adventure game with Pelle Svanslös (English: Peter-No-Tail), a fictional anthropomorphic cat created by the Swedish author Gösta Knutsson and a children's book series about him. The series of twelve children's books based on the character was published between 1939 and 1972. The first eleven books were illustrated by Lucie Lundberg. The books about Pelle are seen as a protest against the ever more overt support seen for national socialism in Sweden during the 1930s, and as such constitute a satire on contemporaneous society. The stories take place in Uppsala, Sweden. The characters of the books are cats, however, they are often based on real people. Pelle is a kindhearted and gullible cat who is constantly being tricked and bullied by Elaka Måns ("Nasty Måns") and his helpers Bill and Bull. However, good always prevails over evil, and Pelle even gets to experience true love together with Maja Gräddnos ("Maya Cream-nose"). A movie by the same title also came out the same year as the game.